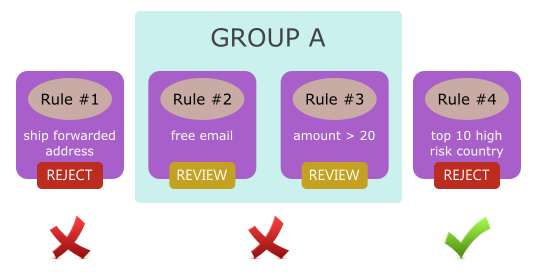 Grouping Rules enable users to group multiple validation rules together using AND logical conjunction for validation. For example, suppose you want to flag an order for review if it originated from a free email provider and the amount is greater than $20, you are unable to achieve this via the existing sequential checking mechanism. Under the sequential checking mechanism, you can either flag the order using the free email rule, or the amount velocity rule, but not a combination of both. This is the scenario where you need the grouping rules. 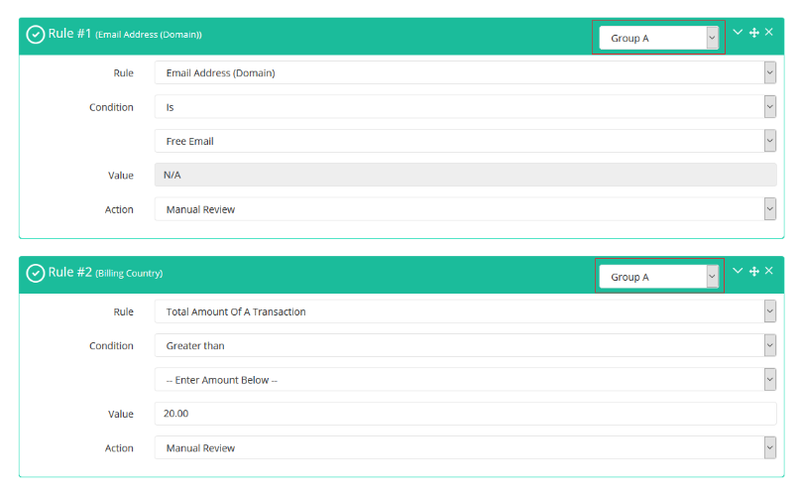 With Grouping Rules, you can now select both the free email and amount velocity rules and group them under the same group, for example, Group A for combined validation. The system will then evaluate the group as a single entity using the AND logical conjunction. In other words, the action will be triggered if both the free email AND amount velocity rules are true, otherwise the system will continue the next validation. Let’s walk you through on how this will work in more details. Suppose you have the below rules configured in your Rules management page. Rule #1: If ship forwarded address, reject the transaction. Rule #2 & #3: If free email AND amount > $20, review the transaction. Rule #4: If top 10 high risk countries, review the transaction. Suppose there is a client, from the top 10 high risk countries, purchased your product that costs $10 using yahoo.com (free email) and shipped to his home address. Below are the validation results. The system will perform the validation from Rule #1, Group A (Rule #2 AND Rule #3) and stopped at Rule #4, as the client was from the top 10 high risk country. The system will then trigger the REJECT action. Consider this scenario again: Suppose there is a client, from the top 10 high risk countries, purchased your product that costs $30 using yahoo.com (free email) and shipped to his home address. How are the validation results. The system will perform the validation from Rule #1 but stopped at Group A, as the client is using a free email with a total purchase of more than $20. The system will then trigger the REVIEW action. As you can see from the above examples, the Grouping Rules is an important and useful feature. It enables you to create a complex and advanced validation logic to better assist you in the fraud checking, which you could never do previously. You can use the Grouping Rules feature on the Rules management page. 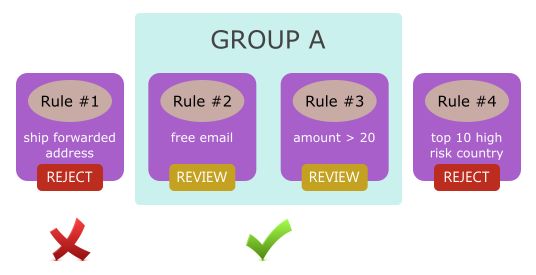 You just need to select the rules that you want to have the combined validation and group them together under the same group name. Save the settings and that’s all. Please see the below screenshot for example. Please take note that you can only select an action for each group. When you change the action on any rule of the same group, this action will be automatically synchronized and updated to the rest of the rules in the same group. The Grouping Rules feature is available from Mini plan onward. You may visit the pricing page to learn more about the number of grouping allowed for each plan. If you are using the free Micro plan and interested to use this feature, you may login and upgrade your plan on the License page.